Producing a tapestry required the diverse talents of many artists and craftsmen. First, an artist would create a design, usually on commission from a workshop manager or independent entrepreneur. The design would then be made into a cartoon, or full-scale model. (The term derives from the Italian cartone, a large sheet containing a full-scale preparatory design for a work in a different medium.) During the 15th century, cartoons were predominantly rendered in tempera on cloth or linen as paper was much more expensive. In the 16th century, cartoons were mostly painted in watercolor on paper. By the mid-17th century, oil on canvas emerged as the dominant medium. Cartoons were valuable commodities, frequently passed down through successive generations of workshop managers in tapestry-making families or transferred from one family to another through marriage, trade, and purchase. Many cartoons were repeatedly modified so that they would continue to appeal to contemporary taste. The manner in which designs were transferred from cartoons to tapestries themselves could be quite harmful to the cartoon, and thus these templates quickly became worn out and were discarded. Accordingly, few cartoons have survived to the present day. The most famous extant full-scale cartoons are the ten cartoons by Raphael at the Victoria and Albert Museum in London, which show episodes from the lives of Saints Peter and Paul. Once the cartoon was ready, the weavers used it in one of two ways, depending on whether they were working on a low-warp or a high-warp loom. Both types of loom consist of substantial wood and metal frames. Like all woven textiles, the structure of tapestries consists of warps and wefts. Warps are the stationary threads and are made of plied yarns of either wool or linen fiber, almost always undyed. Wefts are also principally wool and carry the color. For further embellishment, silk filaments and thinly cut strips of parchment with gold and silver leaf were also used in the weft. On the high-warp loom, the warps run vertically between two rollers, with the bottom one receiving the finished tapestry. 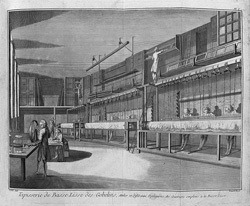 For use on these looms, the cartoon would be hung on a wall behind the weaver, who would look through the warp threads at the cartoon’s reflection in a mirror on the wall in front of him. In contrast, on the low-warp loom, the warps run horizontally between two rollers. For use on these looms, cartoons were cut into strips of about 80 centimeters wide and laid below the tautly stretched warp threads. The weaver would look down, between the warp threads, to transfer the design. After the design from each cartoon strip was woven, the strip was removed, and the completed section of tapestry was rolled onto a receiving beam. The next strip was then laid under the still-unwoven warp threads, and the process was repeated until the entire cartoon had been transferred. For more information on tapestry weaving structures, click here. 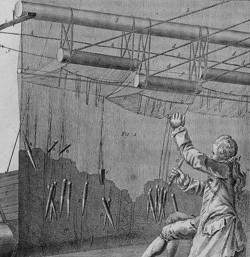 High-Warp Tapestry Making at the Gobelins (Tapisserie de Haute Lisse des Gobelins) (detail), Plate IX from the Encyclopedia, or a Systematic Dictionary of the Sciences, Arts, and Crafts (Encyclopédie, ou Dictionnaire Raisonné des Sciences, des Arts et des Métiers). Paris, France: Chez Briasson, c. 1772. Text edited by Denis Diderot (1713–1784) and Jean le Rond d’Alembert (1717–1783). Engraved by Robert Benard (b. 1734) after designs by Louis-François Petit-Radel (1740–1818). Low-Warp Tapestry Making at the Gobelins (Tapisserie de Basse Lisse des Gobelins), Plate I from the Encyclopedia, or a Systematic Dictionary of the Sciences, Arts, and Crafts (Encyclopédie, ou Dictionnaire Raisonné des Sciences, des Arts et des Métiers). Paris, France: Chez Briasson, c. 1772. Text edited by Denis Diderot (1713–1784) and Jean le Rond d’Alembert (1717–1783). Engraved by Robert Benard (b. 1734) after designs by Louis-François Petit-Radel (1740–1818).